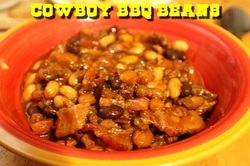 Nothing goes better with Cowboy Cornbread than Cowboy Beans! Click the photo to see the recipe! Combine dry ingredients in a bowl. Stir to mix, and set aside. In another bowl combine eggs, butter and half and half cream. Add the wet mixture to the dry, combining until just moistened. Pour into a greased 9x13 pan and bake at 350F for 30-35 minutes, or until the center is set. (use the toothpick test).